Good portrait photographers know that beautiful lighting is key to creating interesting images. Los Angeles provides so many varied backgrounds and places to shoot, but it's the use of lighting that helps these locations come alive. 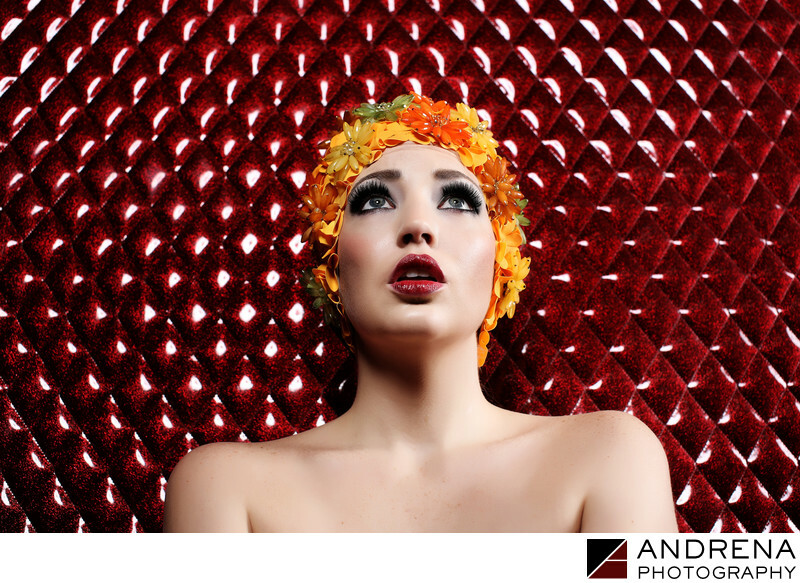 This image was taken against a red polyurethane textured wall. Be positioning strobes to each side of model Sara Liz, I was able to use reflected light to highlight and enhance the texture of the wall. The side lighting was provided by two strip boxes, while the front lighting was provided by a beauty dish. The stunning jeweled bathing cap was created by Miss G Designs. Positioning the oranges in the headpiece against the red backdrop ensured that the final image had a specific color harmony that would be pleasing to the viewer. For this model shoot, makeup was provided by the talented Jacqueline Holden. Model casting is always important when seeking to create a specific type of image, and I personally love working with models who have beautiful bone structure. Bone structure creates angles in a model's face, which in turn help the light fall across facial features in beautiful ways. Sara Liz is a favorite of mine. She has a great attitude and is so fun to work with. Photographed in Los Angeles, California.